#90 Hampton – From March 30 to Sept. 27, the #90 Hampton will not provide service into Forest Park, and will instead reroute around Forest Park via Kingshighway Blvd. and Pershing Avenue (map). 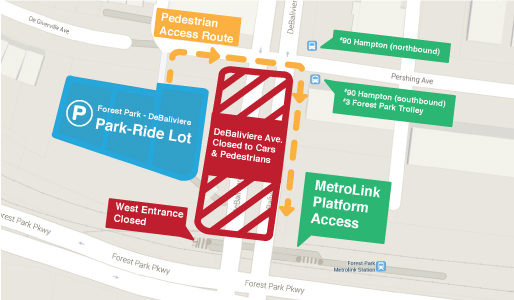 During this period, passengers connecting to the #90 Hampton from the Forest Park-DeBaliviere MetroLink Station will need to board the bus on Pershing Avenue at DeBaliviere Avenue, just north of the MetroLink station. 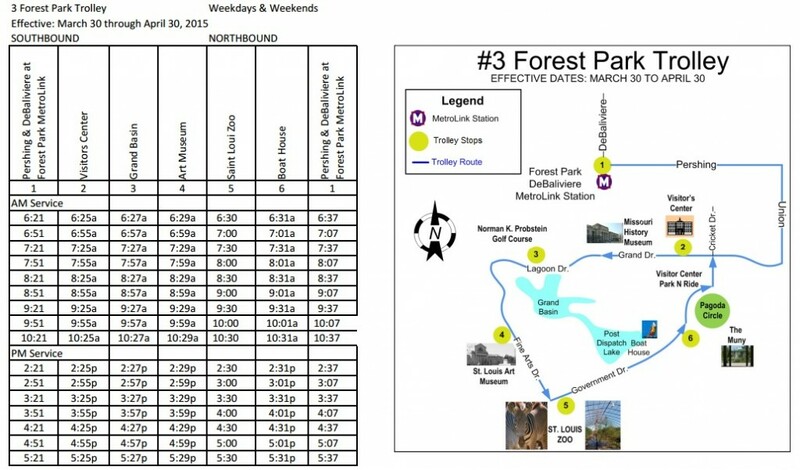 #3 Forest Park Trolley (map and schedule below) – To accommodate employees at Forest Park attractions who would normally take the #90 Hampton to work, the #3 Forest Park Trolley will offer limited service beginning Monday, March 30. From March 30 to April 30, the #3 Forest Park Trolley will operate seven days a week between 6:21 a.m. and 10:37 a.m. each morning, and between 2:21 p.m. and 5:37 p.m. each afternoon. The trolley will start its route at Pershing and DeBaliviere Avenues, just north of the Forest Park-DeBaliviere MetroLink Station, and make stops at the Visitor’s Center, Grand Basin, St. Louis Art Museum, St. Louis Zoo and the Boathouse. The #3 Forest Park Trolley will begin full-day operations on Friday, May 1. Demolition on the DeBaliviere Bridge at Forest Park Parkway is scheduled to begin Friday, April 24. That weekend, MetroLink will not operate at the Forest Park-DeBaliviere Station, and MetroLink Station Shuttles will be used to transport customers by bus around the affected area. More information on the shuttle service will be provided in April. I predict the probability that the 90 Hampton will be unable to meet its schedule during the evening between Oakland Ave and DeBaliviere is 95% or greater. The congestion on Kingshighway and I-64 is virtually guaranteed to make the trip take longer than 10 minutes. While delays are a possibility, our planning department has determined this reroute will be less congested than by going through Forest Park (which the #3 Forest Park Trolley will now serve on a limited schedule). The Loop Trolley construction on the DeBaliviere Bridge limits our access points to and from the Forest Park-DeBaliviere MetroLink Station as well. And using Skinker as a reroute will result in less congestion than either Kingshighway or through the park. question about pedestrian access. Will pedestrians be able to cross Forest Park Parkway from DeBalievie to get to Forest Park? Yes. Pedestrians will be able to access Forest Park using the sidewalk on the east side of DeBaliviere Avenue. Is the demolition of the bridge a permanent thing or will it be rebuilt? What’s the purpose behind the project? Peter, the purpose of the DeBaliviere Avenue bridge closure is due to construction related to the Loop Trolley. The bridge is expected to be demolished and rebuilt to accommodate pedestrian, vehicular and Loop Trolley traffic.